These are General Purpose drives designed for use with Permanent Magnet or Shunt wound DC motors. NEMA 1 enclosed drives are suitable for most industrial applications. The NEMA 4X controls are best suited for washdown or outdoor installations or for extremely dusty applications. Chassis only drives are available for building into equipment, machinery or existing enclosures. Most controls have a dual voltage switch allowing the control to be used with either 115 volt or 230 volt, single-phase, input power at either 50 or 60 Hz service. It is important that the proper voltage motor be selected to use with the available power supply. (four quadrant) are available in NEMA 4X enclosures and are typically used where more precise motion control is needed. These controls also produce both motoring and braking torque regulation. are designed to run two DC motors at the same time in either independent mode or Slave/Master mode. 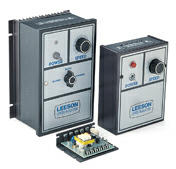 PURCHASE YOUR LEESON DC CONTROLS – SCR SERIES NOW!